After I concat a file using a IO redirect (>>) in linux, it causes %M to appear in every lines in a file. I don't know if I did something wrong. That's the replace pattern (:s/[pattern]/[replace]/) in vim and /g is to replace all occurence in a file. Last year, I bought Google Nexus One to use as my first smartphone. I chose Android over Iphone because it is easier for a casual developer like me to build an application with the current environment (windows and linux). Also, I would better stick with my comfortable programming language, Java. After getting a phone, I've developed a simple application to help me generate my password for everything. Yes (Nerd Alert!! 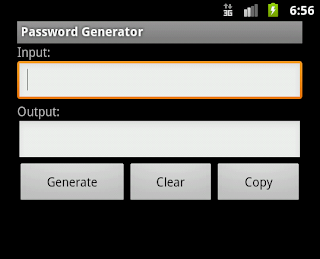 ), I come up with my own algorithm to generate a password from a specific keyword. Therefore, I just need to choose an obvious and easy-to-remembered keyword. Moreover, I can use a different keyword for a different place/websites. For example, the word "Whitehouse" would generate a password "9jk7Gk62". The real algorithm is nothing much; it is built from a simple encryption algorithm, called "ceasar cipher", a bit operation, and a simple hash function. After google to find the solution, from many sites[1,2,3], the problem is with R12 SDK. It doesn't allow space in SDK path. But, if you use AndroidSDK windows installer like me, normally default path is "c:\Programs file\android". First, I tried to change the path in the Eclipse configuration from "c:\Program files\android" to "c:\Progra~1\android". This doesn't work for me since Eclipse will tell me that the directory isn't existed. So, The solution for me is to reinstall an AndroidSDK to a location with out space such as "c:\android". This is definitely a bug!!! After long time without update, I just realize that Blogger pushed out a new template design. In my opinion, it looks better, so I've changed my template without hesitation. The problem is I used custom style for <pre> and <code> tag to represent a program code. When I've applied the template, I forgot to back up the old style. I had to spend some time find the correct style for it although, it is very easy CSS code. So, I will blog it as my backup. Summer 2010 in Bloomington is nearly end (I hope it ends sooner since it's freaking hot here). I've worked as a researcher on TeraGrid project for entire summer. My main task is to create a test library (program) to use against GRAM5 gateway which will be deployed on TeraGrid (soon). It is coded in Java and used for both scalability and reliability test. The problem comes up when I try to submit multiple jobs to GRAM5 gateway from multiple machines. If I start submission at the same time for all machines, program will get a connection reset from a server. I think it is caused by the fact that network router or server has a mechanism to prevent flooding. Default constructor will use System.currentTimeMillis()as seed. Software Developer, Java Programmer, IT, Geek!! All contents is licensed under Creative Commons Attribution 3.0 License. Powered by Blogger.